Since its introduction in 2012, Dolby Atmos has been a dazzling new audio technology that you could basically only experience in fancy movie theaters. But recently, high-end soundbars have started supporting the standard, which was cool if you wanted to spend north of $1,000 on a system. Vizio did what Vizio often does and built an affordable one for $500. The new Vizio 36-inch 5.1.2 Home Theater Sound System is currently the cheapest way to turn your living room into a Dolby Atmos fantasyland. I use that word specifically because this Vizio system uses upward-firing speakers to add height to the sound that comes out of your home entertainment system, and that significantly changes how realistic the experience feels. You can also get the Atmos height effect by installing speakers directly into your ceiling, which is obviously expensive and annoying. The Vizio setup amounts to plugging a soundbar into your TV and two satellite speakers into a wireless subwoofer. It takes about 10 minutes from box to movie-watching. The designs of the Atmos-enabled and non-Atmos Vizio soundbars are nearly identical, with the characteristic silver sides bolted to black, fabric-wrapped speaker units. 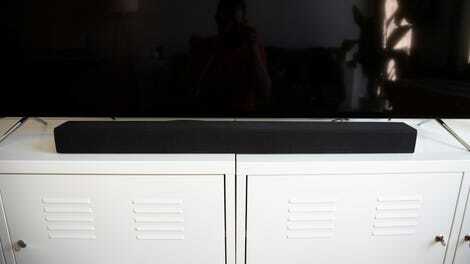 The soundbar itself is, as the product name reveals, 36-inches long and stands a little over 2.5-inches tall. It also comes with some basic control buttons on the top, while all of the other buttons and connections are nicely hidden from view behind and underneath the individual components. Speaking of, in addition to the soundbar, there’s a wireless subwoofer, which is slightly less than a foot-tall, and two smallish satellite speakers that are each roughly the size of a pint glass. There are some notable upgrades to the specs on the new Vizio soundbar system, though. Let’s start with non-Atmos hardware improvements. Vizio says that it’s improved the drivers in the soundbar that ought to improve speech clarity and the company also added passive radiators on the left and right speakers to help with low-frequency audio. Along those lines, the new 36-inch system also comes with a bigger subwoofer that can play bass down to 30Mhz. But really, the new Vizio system’s big selling point is Dolby Atmos, if only because we’re about to see a more Atmos-ready content rolling out alongside Dolby Vision content. This is all part of Dolby’s latest attempt to bring a more movie theater-like experience to people’s living rooms. Atmos launched back in 2012, and in theaters, the technology allows filmmakers to take as many as 128 audio tracks and individually place them into dozens of speakers around (and above) a cinema, instead of needing to place the sound in one of five surround sound channels. There’s also some spatial metadata that creates complex location-based sound and panning effects. The sound is supposed to move in all different directions and mimic what might happen in real life. The newer home theater version of Dolby Atmos is not as complex, dealing with five or more speakers at a time, but the philosophy of producing uniquely dynamic audio remains the same. To pull off the Atmos effect, Vizio has also added two upward-firing speakers as well as additional amp channels and to the soundbar itself. So instead of the sound coming at you in a straight line, it’s bouncing off your ceiling, which is awesome. On the non-Dolby front, the new Vizio system comes with DTS Master Audio decoding and DTS Virtual:X, a multidimensional audio technology that’s a competitor to Atmos. Can’t hurt to have both. I should point out here that I did not test the Atmos-enabled 36-inch Vizio soundbar side-by-side with the non-Atmos bar, so I can’t say precisely how different the two systems sound. By simply offering Dolby Atmos support, however, the 2018 model is more future-proof, and it’s not just because of some new codec or something. Thanks to hardware and software upgrades, the new Vizio soundbar with Dolby Atmos is capable of filling the room with sound in a unique way. This was obvious to me from testing Atmos-enabled content against non-Atmos-enabled content. The Atmos effect is real! Even at low volume, the sound seems to wrap around you. And I’m not just talking about that sometimes eerie effect of the rear satellite speakers chirping behind my ears. Watching Mad Max: Fury Road with Dolby Atmos, it feels like the bad guys’ cars run over you as they speed across the desert, especially when they blow up. By comparison, the light cycle scenes in Tron: Legacy, which was not released with Dolby Atmos, sound simply two-dimensional. That’s because they are. The audio shoots straight out of the speaker, and that hair-bending all around sound effect isn’t there. All this draws attention to an important consideration when thinking about paying a premium for Dolby Atmos, too. Not everything you’ll want to watch—whether via Blu-ray or streaming or broadcast TV—will be mixed for Atmos certified. The technology is new enough, especially in the home entertainment space, that you might be disappointed to find that a cool movie, like Tron: Legacy, doesn’t have Dolby Atmos sound. So when you’re watching the trippy battles between users and programs, you won’t be taking advantage of everything the new Vizio soundbar can do. There’s a good chance this is a temporary problem, as more and more studios release Atmos-ready content. Atmos grandeur aside, the Vizio 36-inch 5.1.2 Home Theater Sound System is also just a breeze to use. If you’re connecting via HDMI ARC, your TV should recognize the system right away, and then you can control everything with your regular remote. The system comes with a separate remote with a little LCD that’s extra handy for tweaking settings. For instance, I found that cranking up the surround sound and tinkering with the equalizer gave the system a nice boost. Vizio also offers some useful features like automatic volume control and night mode (think: less bass to wake the neighbors) that were helpful in specific circumstances. The auto volume control is useful since it prevented my eardrums for exploding during loud action sequences. Did I mention that the Vizio system goes as loud as 101 decibels? That amount of power might be useful in a huge living room. In my tiny apartment, I never took the speaker higher than about 15-percent of full volume, and I think that’s partially because the surround sound effect is so immersive. Other soundbars I’ve tested and enjoyed, like the Sonos Beam, can produce big sound, but I sometimes have to crank them up to 50-percent volume or more. One more thing that makes the Vizio setup special is how easy it is to play audio from other sources on the sound system. Because the soundbar has Chromecast built-in, you can easily cast music from your phone, computer, or Google Home device to the speakers. There’s also Bluetooth connectivity, which is always nice. These are features that are common to Vizio speakers, but still, it’s nice. When it comes down to deciding what to buy, there are two questions you’ve got to ask yourself. The first one is feature-related. If you like the looks of the new 36-inch Vizio system and want to spend not much money on it, last year’s model is appealing. However, if you’ve decided you have to have a Dolby Atmos system and also want to keep things affordable, the Vizio is 5.1.2 Home Theater Sound System a no-brainer. The second question hinges on how much you’re willing to pay for Dolby Atmos. The next cheapest Atmos option, according to Dolby, is a 2.1 Sony system with an Atoms-ready and a subwoofer for $600. That means no satellite speakers, which means you’ll still be getting all your audio from straight ahead. Other 5.2.1 soundbar systems with Dolby Atmos from companies like Samsung cost $1,500 and up. Yamaha will also sell you a wacky one-piece soundbar with 46 speakers inside for $1,600. Or you can get the $500 Vizio 36-inch 5.1.2 Home Theater Sound System. It will make a thrilling addition to any movie lover’s living room, and right now, you’re not going to get Dolby Atmos support in a cheaper system. 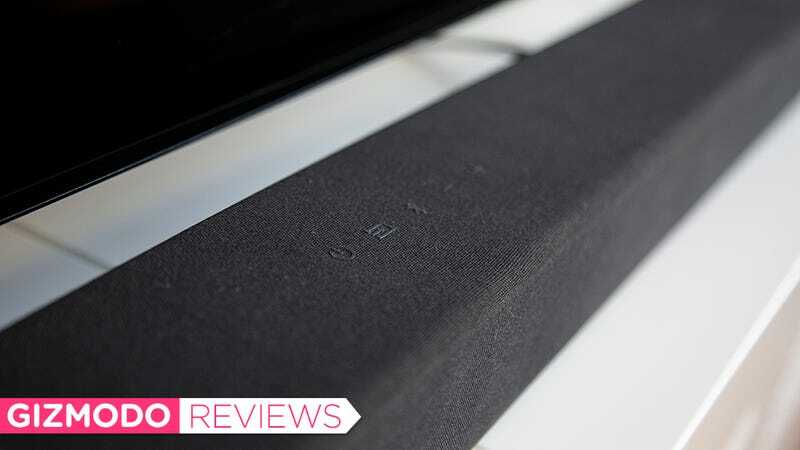 So even if you’re considering some other new gadgets—perhaps smart soundbars like the $300 Polk Command Soundbar with Alexa or the $400 Sonos Beam—think very seriously about spending just a little bit more money on better sound.